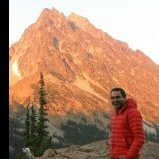 10 days in North Cascades? I did actually search for a post like this, but seems no one goes expedition style down here any more. I have 10 days over the week before memorial day. I was hoping to get deep in the North Cascades- but am not sure what conditions would be like. Can anyone suggest a good linkup or resources- maybe two or three mountains that might lend themselves to a link up? Also any account of experience during this part of the season would be much appreciated. Partner and I are both strong on steep snow, glacier travel, and technical rock, not strong in ice climbing. I'm new to the PNW, but we both have significant experience elsewhere. You're probably aware that the Cascades will still be full of snow that time of year, so ski transport would be a good call for a longer trip. Otherwise it's kinda late for technical snow/ice and early for alpine rock. Good neighborhoods for moderate linkups could be Eldorado/Forbidden/Buckner, Maude&Fernow, Redoubt/Spickard, Baker/Shuksan, for starters. Or could be a good time for a steep volcano route if you catch some nice weather. See this recent thread for more thoughts on early season options. Do a search on 'isolation traverse', 'thunder traverse' and 'ptarmigan traverse'. Skis are a must, unless you really love to suffer. The Ptarmigan would have the most peak bagging along the way.